Fishing pliers tend to be one of those unheralded tools that people forget to bring with them … until they need them. 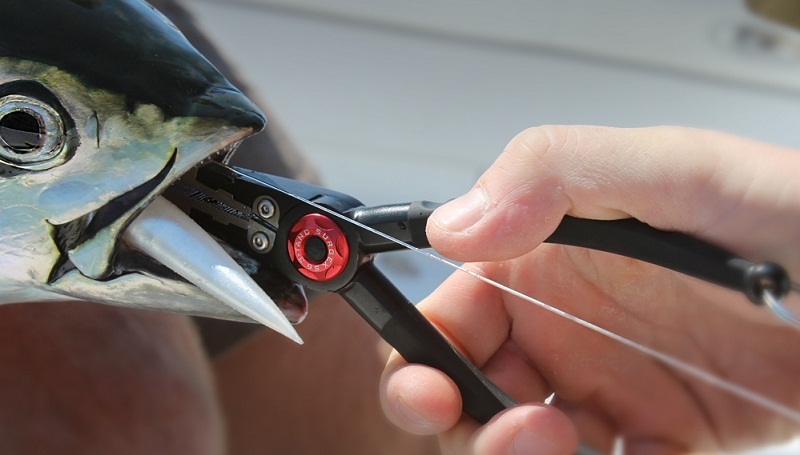 From cutting fishing line, to extracting hooks from fish or from flesh, to setting up split rings and as a general go-to tool in your tackle box, fishing pliers are actually an indispensable tool. Following is a list of what to look for in a set of best fishing pliers and a review of a few good ones on the market. Material: If you have ever used a pair of standard needle nose pliers on your fishing trips, then you already know how essential it is to have a set of pliers that doesn’t rust or lock shut. The new standard is pliers made from airport grade aluminum alloys. Pliers were typically made of aluminum because it is rigid, doesn’t rust easily and it is a lightweight material but the downside of aluminum is that it is a soft metal so it can bend under lots of weight and force. Most high end or popular pliers now use airport grade aluminum alloys to make their pliers stronger and they have become the industry benchmark. Other materials used include titanium and, of course, the old standby, stainless steel. Nose Length: Most fishermen’s memories of using pliers involve needle nose pliers, and with good reason. A needle nose length allows for going deeper into the fish for hook removal. Though typically needed mostly when salt water fishing or when fishing for big fish, the needle nose length is still the way to go regardless. You might as well be prepared. Some pliers have split ring capability or are split ring speciality pliers. One of the pliers ends is hooked for split ring preparation while the other pliers end locks it in place. Due to the nature of using the hooked nose, split ring pliers are typically stubbier than saltwater pliers. Cutting Options: The ideal pliers would have both line cutters and a side cutter. The line cutter is crucial and a standard option of all fish pliers. The line cutter will need to be strong enough to cut braided, monofilament and fluorocarbon line. For steel wire or to cut hooks, you want a very strong side cutter. Different materials are used for the cutters including tungsten carbide and the less desirable stainless steel. Many of the top pliers on the market have replaceable options for the cutters as they may wear down after continual use. Extras: All you need in a good set of pliers is that it be made from a strong waterproof, non-corrosion material, of appropriate length and with a line and side cutter. Some pliers throw in extras that you don’t need, but are cool and may be convenient. Some of these options include a bottle opener, built in LED light, replaceable pieces (like line cutter), soft grip handles, split ring capability and crimpers (for leads or sleeves). The Bite Fishing Tackle pliers are one of the best pliers on the market and easily get a check mark in every key category we have mentioned. Material? Check. These pliers are machined from aluminum alloy and heat-treated to give them maximum strength. Line cutter and side cutter? Check. The cutters, which are fully replaceable, are made from sleek black tempered stainless steel. The cutters are sharp and strong making it efficient and trouble free to cut through the strongest braided lines. Easy squeeze technology? Check. The pliers are spring loaded, giving them strong action with little force and they come with a solid rubber grip. The building materials and grips make this tool corrosion free which is crucial if you are saltwater fishing. Options? Check. 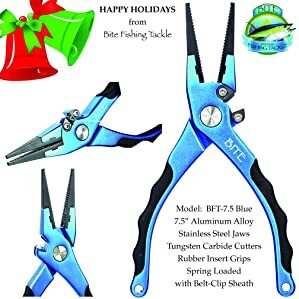 The pliers come in two sizes, the longer 7.5” without the split ring nose which comes in blue or red, and the 6.5” version with the split ring nose. The piers also come with a sheath and a lanyard. This is a set of pliers that you will only buy once. The Piscifun Aluminum pliers also come available in two styles, the saltwater fishing pliers and the split ring nose pliers. The first major difference between the two is the length of the pliers, the longer 7 3/4” of the saltwater version, versus the 6 2/3” of the split ring pliers. Visually the two are quite different as well. The Saltwater pliers are heavy duty, long nosed versions while the Split Ring version is shorter, with a stubbier nose. One of the pliers ends of the split ring has the distinctive hook to separate and lock the split ring for easy assembly to your line. The split nose pliers are lightweight with a series of holes in the handles to keep them light, but strong. 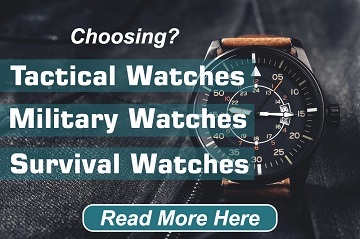 Both sets are made of corrosion proof, titanium coated stainless steel and with a spring-loaded grip. The pliers ends are serated. The titanium coat adds a layer of hardness while the serration prevents slippage and gives a better grip. The spring load allows for an easier grasp and can be used with one hand. On both pliers, the top and side cutters are made of tungsten carbide and can easily cut any line, from mono to braided and fly line. The pliers also have crimping slots. The carbide cutters are replaceable. The pliers are available in a variety of colours, from blue, red, purple, gold and silver. Most models come with a belt loop clasp, a tether and a nylon sheath for a variety of easy transportation modes. These pliers are a versatile all-in-one tool that can be used for fishing, hunting, camping and other outdoor and general use. The component pliers are made from hardened stainless steel and one of the pliers ends is a split ring hook. The pliers can crimp, grip and help with split ring assembly. 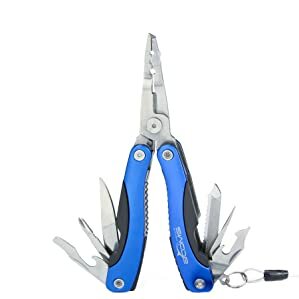 The pliers also feature fishing line cutters, knife, Phillips screwdriver, can opener, flat screwdriver, bit driver, bottle opener, awl, 3 side file, saw and hardwire cutter. The component elements all fold into the handles of the hardened plastic handle to make for easy and convenient portability. The hardened plastic saves wear and tear from salt and water. The entire pliers assembly then folds into one easy to carry in one hand tool. 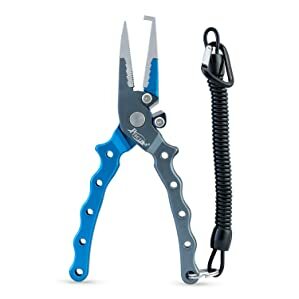 The pliers are available in silver, blue and black and come with a nylon sheath with belt loop clap and a coiled lanyard. The Booms Fishing L1 13-in-1 fishing pliers are the Swiss Army Knife of the fishing and outdoor world. Fishing pliers, whether the longer nosed saltwater type, or the shorter versatile split ring nose version, are an indispensable tool. It’s time to move away from the days of using any old needle nose or small pliers found in your garage or toolbox and move into the fast growing and versatile world of speciality fishing pliers. You’ll never regret buying the right tool for the job.